Show big kids how lucky they are to have a little brother or sister with this cheerful personalized book. Kids sometimes see the arrival of a new baby in the family as a cause for jealousy, but this charming, customized hardcover book can help those new big brothers see how they fit in the picture. 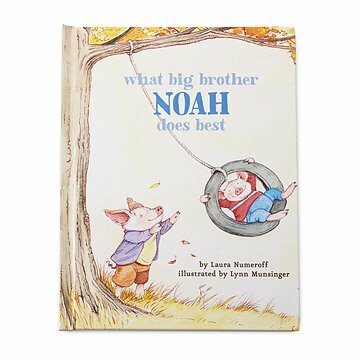 Written by Laura Numeroff, author of If Your Give a Mouse a Cookie, the book explains all the things a big brother can do for his little siblings. Big bro will be delighted to see his name appear on the cover and throughout the story, along with a special dedication message from you on the front page. The book is written as if regaling the new sibling with all the loving things the older child will do. This helps to model positive sibling interaction without feeling preachy, and also provides an opportunity for big brothers to share the book once the little one is old enough to enjoy story time. The pages are warmly illustrated by Lynn Munsinger, with cute tigers, bears, pigs having adventures with their little brothers or sisters. Printed in the USA. Click here to check out What Big Sister Does Best. Everything is Awesome about the personalized books! "Cutest, sweetest gift ever..." said my client. I am a real estate agent who had an expecting client. Her son came on all of our property showings, and was always so happy and patient. I just want to get him a personalized gift that was relevant, and this did the trick! My nephew and his wife are expecting their second child. The older son wasn't thrilled about the news. Turned out the book couldn't have been a more perfect Christmas present! I like the book very much. It is going to be a present for a friends son, who just got a little sibling. I hope he'll be ok with the thin paper pages - I would have liked a board book version which is easier to handle for small kids. It works only if there is just one older sibling, would be nice if there were also a version with two or more older siblings welcoming a new baby in the family. I recommended the books to 2 of my friends and they both ordered custom books for there family. Great little book. I wish you could personalize it even more, not only the big brother but personalize it for the other sibling or even just to another boy or girl pronoun. A perfect gift for a Big Brother! We love Laura Numeroff and her "If you give . . ." series! When I saw this personalized book offered I knew it would be a hit for my grandson. He has been so excited to be the big brother to his baby sister! He was amazed that the author knew his name (!) and wrote a book especially for him! Perfect way to begin promoting a positive relationship between siblings from day one while making older siblings feel like a special part of their expanding family!